The headline pretty much says it all. 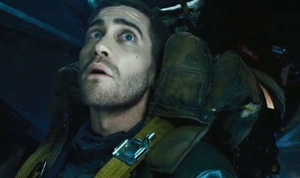 Producer Mark Gordon and ABC Studios are developing a TV adaptation of Duncan Jones' scifi action thriller starring Jake Gyllenhaal for CBS. I can totally see why too. The episodic nature of the film lends itself to a serialized television format while there could be a 24-style mission each season and a main character trapped in a loop. We've certainly seen shows like this before like Quantum Leap and the failed Journeyman. CBS doesn't have the best record of edgy, ground-breaking TV of course, though they did give us Jericho, which, while schmaltzy, was still a great post-apocalyptic yarn. What do you think of a Source Code TV show? If it's any good it will be canceled after 1 season. The plot of the first episode should be Jake Gyllenhal going back in time and telling CBS execs how lame their idea was. In '06 there was day break, which was a groundhog day tv series with a twisted conspiracy. I think that series was the closest to source code's plot, and i thought the show was good fun. However.. I'm questioning what the point of a tv series would be, as none of the changes affect the current timeline - they only spawn parallel universes. There would be no rewards for our heroes.. They would still have to live with their past tragedies and having to settle to punishing the guilty. Turning the show into CSI with a perfect surveillance system. You could monitor murders/disasters/etc and question and torture suspects in parallel universes and compare notes between them without even meeting the suspect in the primary universe. You could power a small country by attaching orwell's corpse to a generator.